Delta has formally apologized to Dave Schneider, the musician whose vintage guitar was shredded by the airline's baggage handlers at a Detroit airport last month, and offered to pay him for his prized ax. Schneider, guitarist and singer for Hanukkah-themed rock band The LeeVees and the hockey-themed Zambonis, had asked Delta staffers not to check in his 1965 Gibson ES-335—which he estimates is worth about $10,000—on a flight from Buffalo, N.Y., to Detroit, Mich. He asked if he could carry it on the plane instead, but he was denied. 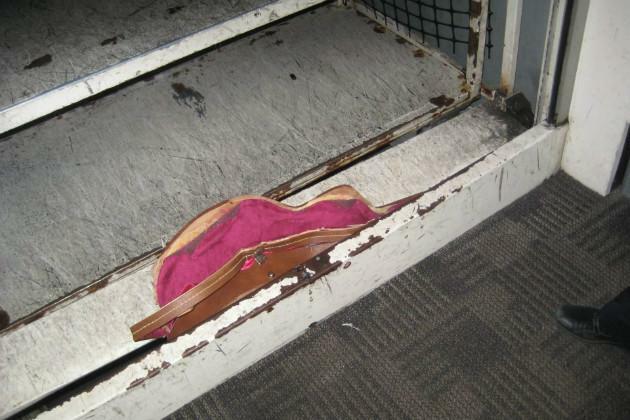 After landing in Detroit, the case carrying Schneider's semihollow-body guitar became lodged between the mobile service elevator and a rail on the loading dock, shaking the elevator door. The case even bent a steel beam. Schneider said he was then given the "runaround" by Delta. The airline reluctantly offered to cut him a check for $1,000 in Tampa, Fla., his eventual destination. Schneider refused the check, because he didn't know how much the repairs would cost. The online claim forms he filled out after the guitar carnage were blank when Schneider later checked on them, and two emails he sent to Delta chief executive Richard Anderson were not returned. On Friday, after Yahoo News first ran the story on Schneider's ordeal, a Delta representative contacted him and this week agreed to pay for the guitar. Delta also gave him a pair of free vouchers for future flights. "We all know Gibson guitars rock," Schneider wrote in an email to Yahoo. "But at this moment, the Gibson company is rocking even harder than Pete Townshend's Les Paul." Schneider says he plans to purchase additional guitars from Gibson for an upcoming charity auction. "To be honest, with Gibson reaching out to me," he wrote, "that's the cherry on top of the best musical nightmare ever." "When a company obviously does something wrong, they should quickly find a fair solution," Schneider wrote. "It's not about a guitar, or a musician, it's about making your customers feel good and trust that they are in good hands. Sadly, in this case, I felt neither warm or cozy. The solution would not have happened without the mighty power of social media (thanks to Yahoo, CNN, Gawker, Facebook and every single person that hit share). "I received quite a few apologies from different folks at Delta which seemed a bit forced," he added. "But I will say that the last email which I pasted below was refreshingly genuine." I want to further add apologies on behalf of myself and the entire Delta Executive Leadership team for the inconvenience and stress this situation caused. We are reviewing the series of events in full to ensure appropriate steps are taken to prevent future occurrences. Again, my sincerest apologies--please feel free to contact me directly if you would like to discuss further.